Yoshi Sushi is Stikky Media's favorite lunch spot here in Victoria BC. 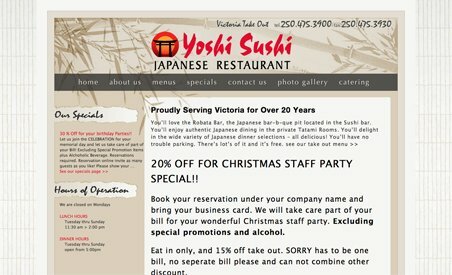 Our staff can be found eating delicious Sushi and Japanese Food at Yoshi almost every Friday. We provided some free basic Search Engine Optimization services for them to show our gratitude.